Well hello spring...didn't seem that long ago when it was NYE and I was Sat at home enjoying hotpot with hubby thinking not long until the little one arrives. The last few months have flown by, sadly my maternity leave is coming to an end but luckily my mum will be taking over so she's in safe hands and I can return to work with no worry. The last 3 months have been busy non stop around the clock and I don't think I will experience anything else in my life quite like it...being a mum really is 24/7 job especially during the newborn stage. I would be feeding then winding for ages waiting for that burp otherwise milk will come back up and soon as you put her down it's almost time for another feed when she was feeding every 2 hours. In between all this you need to get yourself dressed, make lunch, wash bottles, housework, sort the dog out and other chores that need doing. I am so glad we have internet shopping / online banking that makes things just a little easier because there are not enough hours in the day to pop out. Sounds crazy right....so for those who think maternity is a doss it's far from it and being at work is a doss! Having said all that I have really enjoyed it and it's one of those things until you experience it for yourself you won't understand. So before my mum comes to live with us I need to do a massive spring clean to get the apartment in order to make things easier for all of us. The idea of living a simplified and uncluttered life with less bits and pieces lying around or piling up sounds attractive. This is not just spring cleaning around the home it's also sorting out my finances and bumping up that saving account and clearing off the remaining payments on our car earlier. It's time to declutter but where do I begin!!!! I think for me a clean / tidy home comes with a clear mind which is the best way to begin. With the baby we have extra things lying around and with the right storage my home can still remain tidy / minimal believe it or not. Every home needs a big clean at least once a year, when I was young spring was the time to do it as the days get longer and warmer you are more likely to get off the sofa and start clearing out all the dirt / dust accumulated over the winter months. Yorkshire based handmade furniture company Distinctive Chesterfields looked into peoples cleaning habits in the UK and asked 1002 people "Which room of the house do you hate to clean the most?" I think the results are obvious being Kitchen / Bathroom and Garage being the least favourite with the bathroom getting a whooping 41% followed by 24% the kitchen. I have to say I agree with the order of the results below except we don't have a garage. 1. Plan for a weekend to do the entire spring clean with hubby so he can clear out his wardrobe and his own things. 2. Clear out grown out baby clothes / anything else we don't need or no longer use. 3. Tidy up draws to create more space to put more of the things that are lying around creating a cluttered look. With everything tucked away in draws etc it will generally give you more of a tidy feel. This applies to kitchen cupboards (throw out expired tins or gone off food in the fridge and freezer) / bathroom products / things generally lying around / clothes and junk draws. 4. Once all this clearing out is done look at I have and see what I can sell and start advertising on gumtree / ebay etc and anything you cannot sell donate to charity. 5. Once I have decluttered and got rid of stuff I no longer need it's now easier to get on with the spring cleaning. I tend to start with dusting and wiping down surfaces around the home, you can read my post on cleaning tips here. Worth emptying the hoover and cleaning out the filters a few days before so your hoover is working to it's maximum strength. We use a pet dyson so we can actually see how much we are hoovering up which is always good. 6. 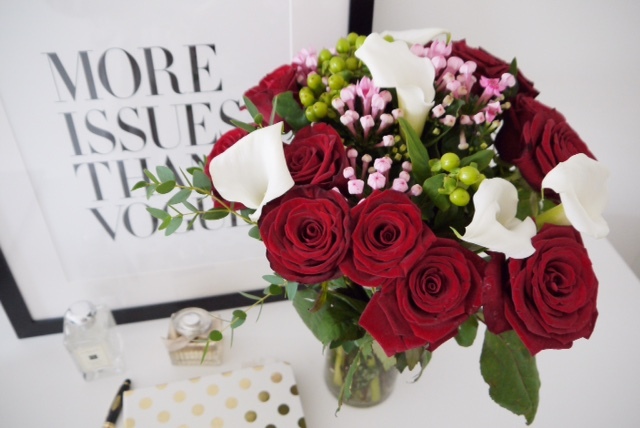 I usually finish off with some fresh flowers in the lounge as it lifts up the room and makes the place look / feel refreshed. 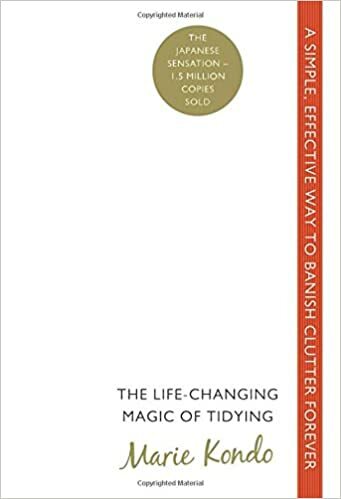 I have heard a lot of people rave about this book which is The Life Changing Magic of Tidying which is suppose to be a simple and effective way to banish clutter forever!!!! What do you do when you spring clean and do you have any tips to share?